Patty says she was seeking an alternative to mayonnaise based chicken salads when she developed this recipe. In addition to the very appealing chicken salad croissant sandwiches featured here, she also uses the recipe as a side salad with larger meals and sometimes she uses the salad mixture to fill the cavity of a cantaloupe melon wedge. Cook chicken breasts, your preference of fry, microwave or grill, until done. Allow to cool before cutting into bite-sized pieces. Dice celery stalks medium-sized pieces. Cut grapes into halves. 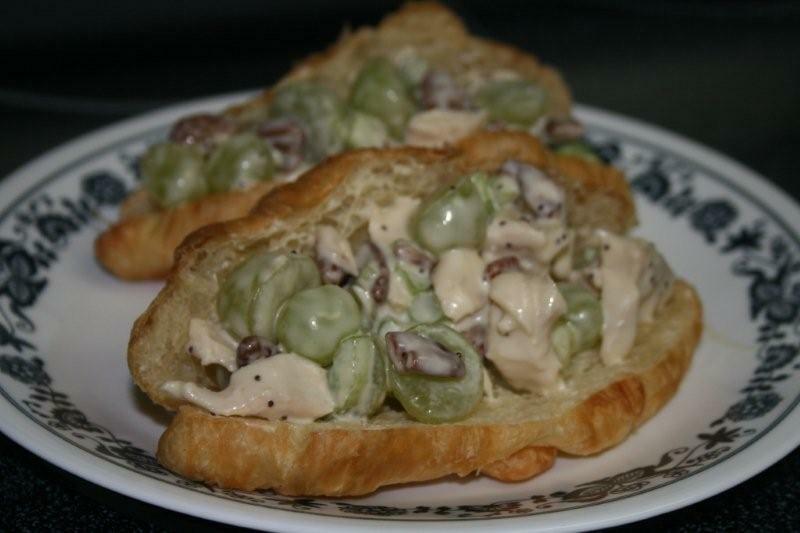 Mix chicken, celery and grapes with chopped nuts. Add dressing, enough to coat and to taste. Fold until well mixed. Chill in covered container. Slice croissants and ladle in salad mixture to fill croissant.